What to keep and what to toss are always a question when organizing, especially when working through papers and documents. Here I discuss the IRS recommendations for record retention and how to implement them in your home. My first recommendation is to set up a filing system with tabbed hanging file folders and labeled manila folders. This makes sorting documents SO MUCH EASIER! 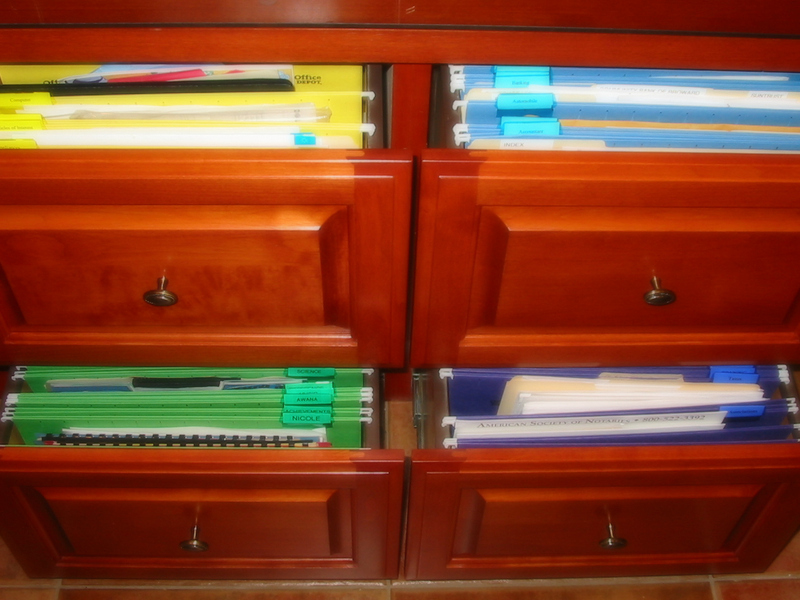 I use a customizable color-coded categorical system for my clients, but even just labeling a few folders will help. Now what to keep and for how long. The first point of reference is the IRS record retention guidelines. The important point to note is that the period of limitations that the IRS can impose additional tax or offer you a credit is 6 years. This is if you haven’t filed a fraudulent tax return or never filed at all, then there is no limitation with which you can be audited. Therefore it is a good idea to keep tax substantiation records for 7 years (current year plus 6). However most CPAs recommend keeping your tax record permanently. The good news is this is actually a small amount and can fit in one manila folder for the average household. Another thing to consider when storing records is whether you need them for insurance or legal matters. I recommend keeping insurance explanation of benefits for 2 years. This allows any billing questions or concerns to be addressed. If after reviewing your statements you determine that you can deduct your medical expenses then file your medical statements and explanation of benefits with your tax documents, in other words 7 years. 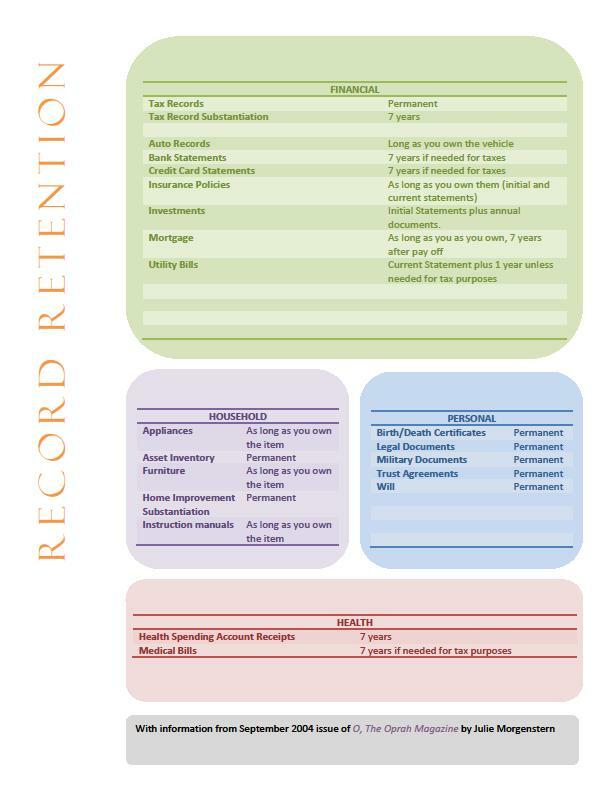 To learn about what records are required for tax substantiation please visit Health Record Retention. Julie Morgenstern wrote a great article in O magazine about household record retention listing individual items and their retention time including household management documents. Below is a quick table featuring some of the information in that article. Each situation is unique so I hope that I’ve given you at least some information to start the process. And feel free to ask any questions you might have in regards to records retention or organizing! This entry was posted in Organizing: Space, Paper and tagged documents, Filing, organize, organizing, paper, record retention on April 25, 2013 by Organizational Specialist. I pretty much adhere to all of these guidelines. The only thing I would add is medical records. I try to get copies of important medical records from my doctor. Things like EKG results, blood test results, hearing /eye exam results,etc. They are required to give them to you if you ask. They are very handy if you have to change doctors due to moving or retirements, need to see specialists and so on. We expect the doctors to exchange information readily but sometimes it is like pulling teeth to get them and then they are incomplete. You don’t want to have to start from scratch with a new doctor. I fully agree!! Another item I didn’t put on the list was school records, transcripts, and diplomas. All things you might want to have in your files. What a great blog! I’m visiting everyone that mentioned their blog on Facebook today and learning so much! We bought a very high quality scanner a few years ago, and it changed the amount if paper clutter in our household tremendously. Just make sure you’re backing up to a server or keeping a disk copy in a safe deposit box! Thank you! I am so grateful for all you do for PWC residents through your blog. I would be clueless about local activities if it weren’t for your calendar! Thank you and great tip! the link for IRS Guidelines is no longer working. Just an FYI. Great post. I love the detailed information. Thank you so much for bringing this to my attention! I have updated the link to direct you to the general guidelines for tax record keeping. The guidelines haven’t changed just the link. Thank you!